CENational recently created a summary report from the Momentum youth conference, held last week in Johnstown, Pennsylvania. 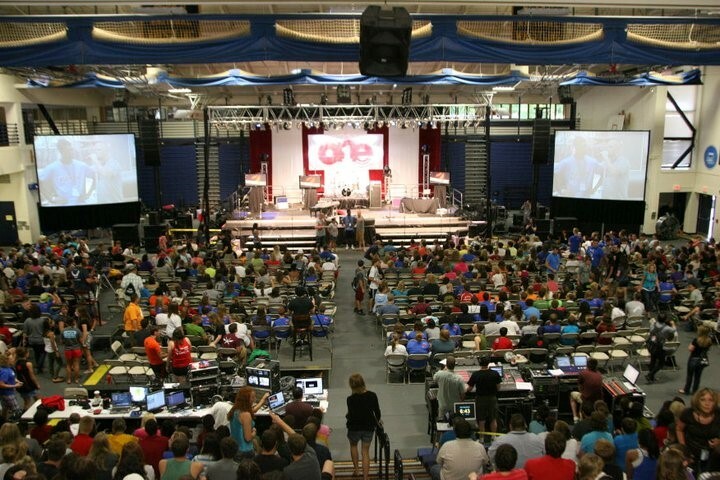 Momentum 2011 saw 1,625 students and adults be challenged to impact ONE person for Christ this year. Through main sessions, Power Trax, youth group times, outreach activities, and more, God moved in an amazing way through the lives of those who attended. Everyone was called to make a commitment to reach ONE person for this next year. Using two doors on stage as his main illustration, Jim Brown, senior pastor of Grace Community Church in Goshen, Ind., gave a powerful salvation presentation on Wednesday. Many students came forward to receive Christ. Chuck Bomar, pastor of Colossae Church in Portland, Oregon, began his message on Thursday by telling students, “You’re Better Off Without Jesus.” Deeper into his message, he clarified this statement by showing students that, in place of Jesus continuing to live on the earth, Jesus sent the Holy Spirit. “That’s why Jesus left the Holy Spirit so you can live a life worth living in the midst of a broken world,” said Chuck. David Nasser spoke twice on Friday, sharing how God has guided him through many difficulties in just the past year. David took students to Isaiah 41:9, explaining how God is with them, so they shouldn’t fear. After main sessions, students entered into Power Trax, giving them the opportunity to learn more in smaller groups. Afternoons were filled with outreach opportunities, NAC and Quizzing, on-campus events and more. There were many outreach opportunities and students brought items such as school supplies and hygiene products for “Acts 1:8-crates” to help the people in Johnstown. During Momentum WaSH packs were assembled to be shipped to Haiti, an offering was given to benefit Haiti and Urban Hope, and more. Lancaster Bible College, one of Momentum’s sponsors, even donated 300 backpacks. The entire conference was involved in Saturday’s outreach called “Acts 1:8.” Students and adults took the love of Jesus to the surrounding Johnstown community, to areas an hour or more away from Johnstown, and to Haiti through food packing. Momentum 2012 will be at Eastern Kentucky University in Richmond, Kentucky, July 17-22, 2012. Buildmomentum.org and facebook.com/buildmomentum will have details as they come available.